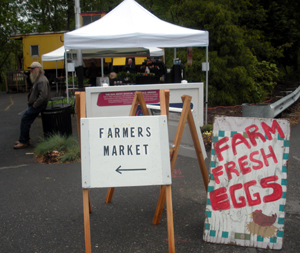 On my way to and from my walk this weekend, I stopped in at two farmers markets I hadn’t yet sampled. The Parkrose Farmers Market is actually quite convenient from my side of Vancouver, just south of Airport Way near 122nd. It was opening day and they were giving out shopping bags and door prizes. At this point in the season, it’s a small market. I bought mustard greens, potatoes and onions at a produce stall and bagels from Gabriel’s Bakery. They have food vendors, plants, arts and crafts and an entertainment booth. 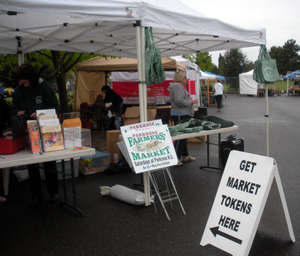 On my way back from the walk at Mount Hood Community College, I stopped by the Troutdale Farmers Market. Now, this one was truly tiny, just four tables. But they had exactly what I wanted, farm eggs and salad greens and some fingerling potatoes. It was a good stop. On Sunday I stopped at the Vancouver Farmers Market and bought another 12 lettuce starts. The lettuce starts I planted three weeks ago are really going to town. The lettuce I planted in my planters is starting to take hold, but the most recent starts I made indoors are wimpy. I transplanted all of the my starts except the tomatoes, but I fear they are all anemic failures. I have good hopes for the tomatoes and pepper, which I will transplant in two weeks. I planted seeds for carrots and onions outdoors right before a big thunderstorm squall came through. I hope it didn’t wash them all away! I am thinking that next year I will plant seeds outdoors and buy starts for tomatoes, peppers, etc. rather than trying to sprout them inside. I just don’t have the right light, etc.